One of the benefits of a fob (or card) controlled burglar alarm is that each fob is uniquely programmed and therefore it’s easy to report on who has set the alarm and when. This can be really useful information for a business anyway – knowing what time the business was opened up and locked up and which members of staff were responsible – but it was particularly useful recently for a client of ours who unfortunately was victim to a break in. How so, you might ask, when they had a burglar alarm? Well, in this case, the alarm had been set when the staff left the building and was set when they returned the next day but the premises had been ransacked in the interim and it was not triggered. A mystery? Actually, no. Because it was a fob operated alarm we were able to piece together what had happened. The information stored in the system showed that yes, the alarm had indeed been set as per procedure but it had been unset by a fob and then reset some time later. This showed that the perpetrator of the break in had to be in possession of a fob. Not only did the system reveal the times it was set and unset, it also told us who the fob belonged to. Busted. On this occasion, it was a disgruntled ex-employee who had retained a fob after they left. Clearly they didn’t realise the kind of data that the system stored or that each fob could be identified individually. While they damaged the CCTV equipment in order to prevent them being identified, they weren’t able to deceive the alarm. It just shows what a useful system your burglar alarm is, but it does rely on being operated and managed properly. Read our review: Best burglar alarm systems. 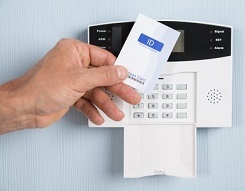 You can see more about what information your alarm system can give you here and about the risks that ex-staff can expose your business to here. For further details about commercial burglar alarms, call us on 0345 833 5543 or send us a message.